SAP has prepared a first version of a SAP PO upgrade testing tool – PIT. It’s being shipped with SP14 to SAP PO which is currently released. The tool perfectly complements Int4 IFTT testing tool in one scenario the so please have a look how you can configure it to help you perform an SAP PO upgrade more easily. In order to use SAP Test Tool you need to have SAP PO 7.5SP14 (where you can install it or run test scenarios) but if you just want tofeed the SAP Test Tool with data you can use a system from 7.31 SP17 or 7.5SP06 or higher. For each message used as a source you need to enable loggingon BI, MS, AM. Test system – SAPPO system in the landscape which is used for testing – either as source(feeding the Test tool with messages) , target (where sender’s messages areexecuted) – those are used in dual stack to single stack migrations or both(sender and target) which is a typical use case for regression testing on asingle system. Test Data Set – aset of messages (successfully processed) which is a subject for testing. In order to be able to create the configuration and run ityou’d need the following roles: SAP_PIT_TEST_DEVELOPER, SAP_PIT_LANDSCAPE_ADMINISTRATOR. 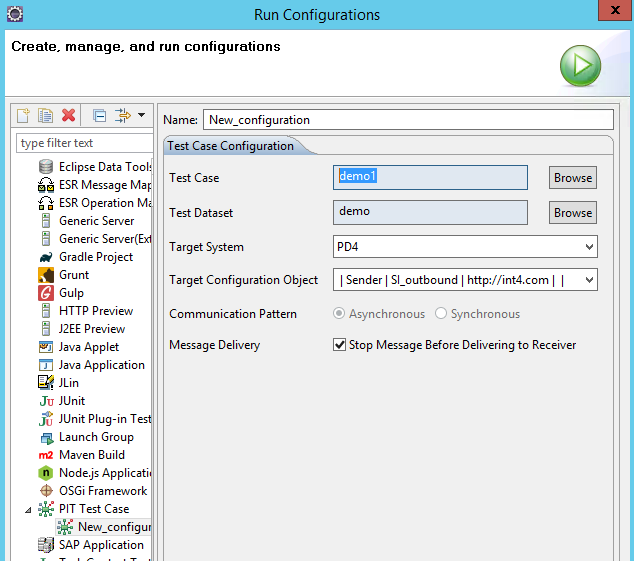 Currently SAP Test Tool is using NWDS as a mainconfiguration tool. The scenario below will describe how to do regressiontesting on a single SAP PO system. We will find a successfully processedmessage, do a mapping change and see what will happen once we reprocess thesame message via the same ICO. Ideally it should display all of thedifferencies between the two runs. Open NWDS and find the new perspective: SAP ProcessIntegration Test. 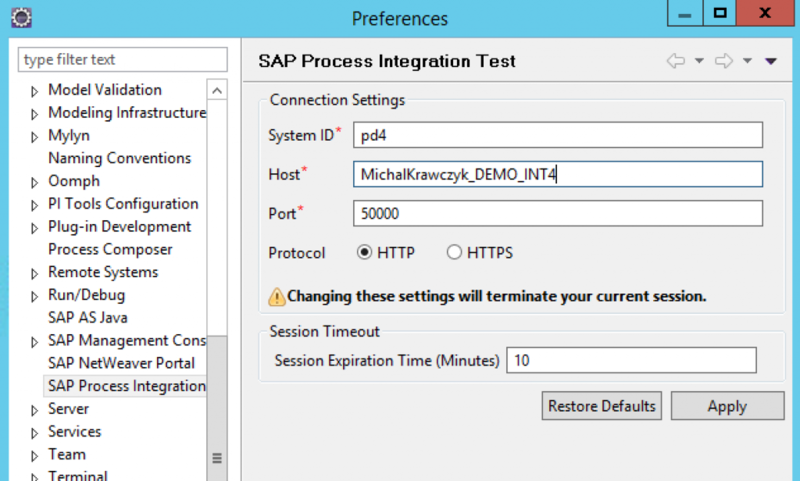 Open preferences and insert connection data to your SAP POwere the SAP Test Tool is installed. In the next step you need to define the systems (source andtarget) where you need to run your tests. In this case it’s the same systemwhere SAP Test Tool is installed. In the next step we can start creating Test Cases. Select the type of the flow you want to test. In the next step it’s time to select the routing objectitself (ICO). 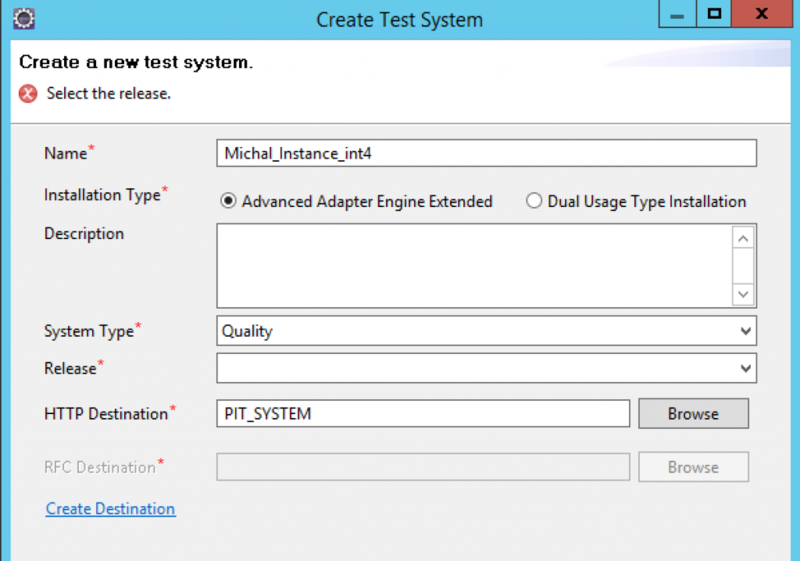 In the next step the Test case is created so we can populateit with test data. 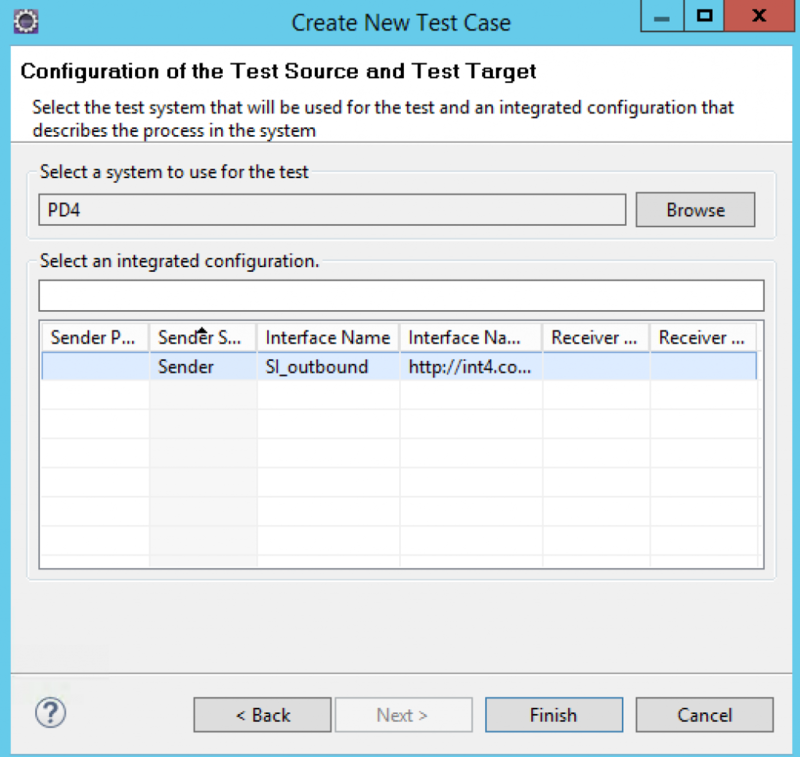 In order to do that select the Test Data tab of the TestCase. Then select the „Add“ button to add messages to the testdata where you can specify the source system from which you want to fetch thedata. Next select the time range when the message was created and the message itself. On the Verification tab of the Test case you can also definewhich parts of the message should not be checked (dates, etc.). 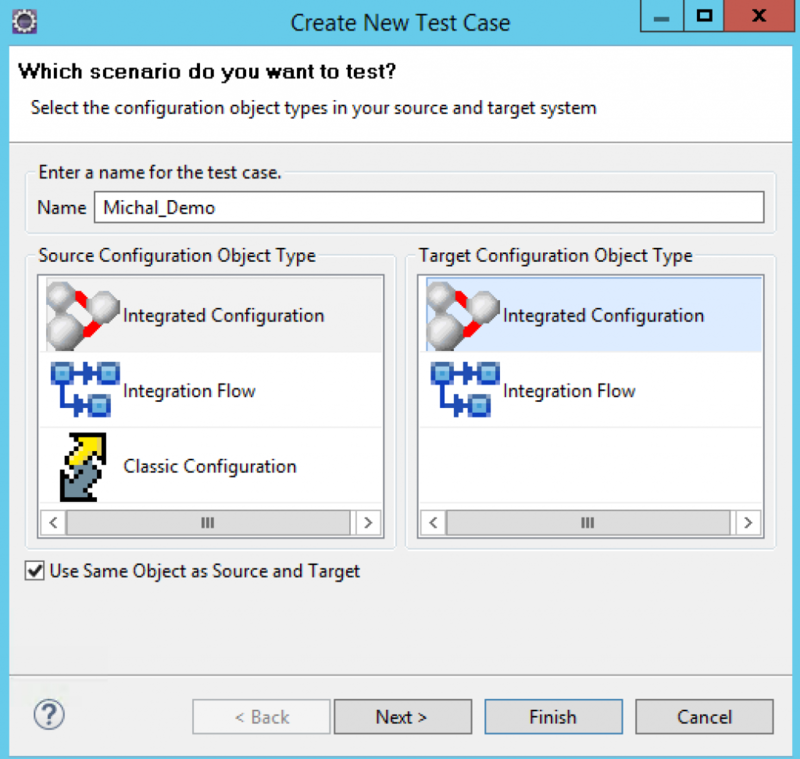 This step finishes the configuration/customizing part of theSAP Test Tool. 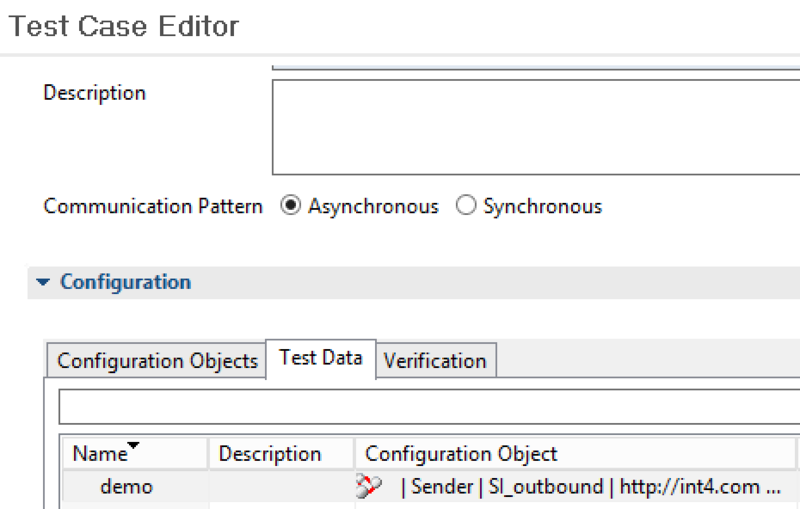 In order to run the test you need to create a new runconfiguration. Where you need to specify the Test Case and the landscape ofthe execution. What you can also select here is the checkbox „Stop messagebefore delivering to Receiver“ which will automatically cancel the Test messageafter processing so it will not overload the receiver system. 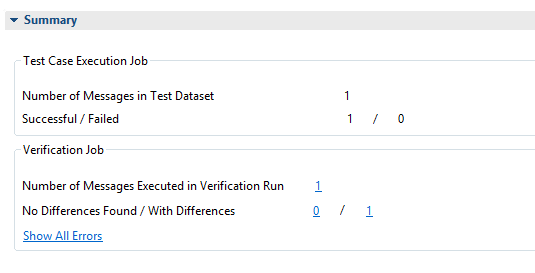 Once you press Run the Test Case will get executed and theTestRun is executed you can send it for Verification which will compare the old(original) target message with the new one created by executing the Test Case. As I’ve changed the mapping before running the Test Casewhat we can see is that there are some differences found. In the Error Overview section we can see a more detaileddescription talling us the what is different between the original message andthe one from the Test Run. SAP Test Tool is a free test tool provided by SAP which can help in some SAP PO Use types mentioned in this article. In case you’d need to Test some other use cases like the ones mentioned below fell free to contact us about a demo of the Int4 IFTT (the only SAP certified tool for testing all SAP middleware scenarios). int4 booth at SAP Teched Barcelona 2018! We’re happy to announce that we’ve been approved to become an official exibitor at SAP Teched Barcelona in 2018 (23rd-25th October). We will be presenting our SAP certified automated regression testing and service interface virtualization software – IFTT. With the use of int4 IFTT you can fully automate testing of all your SAP PO/AIF/CPI/IDOC flows in both the middleware and at the SAP backend system. All will happen without source system access as we provide an unique service interface virtualization concept without the need for additional hardware or software. With this great news we also have a suprise for you. Two of our experts and SAP Press book authors SAP Mentor – Michal Krawczyk and Mateusz Nowak will be available for you at our booth everyday from 13:00-14:00 to answer all of your SAP PI and SAP AIF related queries. Please come to our booth to have a chat about SAP integration anytime during the day and have an amazing teched experience. How do you want to spend this summer? Welcome Spring in this year by joining our budding automated testing webinars for SAP application interfaces! Every webinar we have is a unique webinar that will provide you insight into how int4 IFTT can help to enable you to test your SAP application interfaces faster and smarter. In all 4 webinars we will dive straight into the action and will cover a business and an int4 IFTT based answer to that business case. Follow this link to join our Spring Webinars. SAP Cloud Platform Integration supported! Int4 IFTT is an automated software for testing application interfaces and integration landscape in SAP environment. To ensure maximum compatibility and versatility int4 IFTT has been designed in an open architecture allowing int4 IFTT to work both with SAP and non-SAP middleware’s. Int4 IFTT supports not only SAP PI /PO but it also handles SAP Cloud Platform Integration (former HCI). Passing the variable value from previous case– passing variable from previous test case works in scenarios where it is expected that the interface document will consume number generated by previous test case i.e. inbound delivery to PO created by eCATT recording. Thank you for your attendance. We are glad that so many of you took interest in the subject. For those who somehow missed it – look for information about upcoming webinars on our website! For more details see SIT 2017 Munich. We hope to see you on upcoming SIT in Paris, December 1st 2017!